Friday night, David and I went to a memorial service for a friend and former colleague who died in his mid-40s of natural causes. Darryl was a prankster, an inveterate giver of advice (I remember him giving me dating advice circa 2005), and someone who loved to eat and drink. He would have loved people getting together to raise a glass and tell funny stories about him--it's just a shame he couldn't be there to see it. ﻿﻿On a less somber note, it was a weekend filled with mostly great, sunny weather and friends. My very first boyfriend from high school came through with his family after disembarking from an Alaskan cruise and we met them for dinner. We also went to a fun potluck at our friends Arundel and John's, to which I took these brownies. Brownies day 1, fresh out of the oven. I know everyone swears they have the best brownie recipe, but I submit this one for your consideration. I call them the "World's Best Brownies," which is probably an exaggeration, but they are simple, adaptable to mix-in ingredients and utterly delicious. 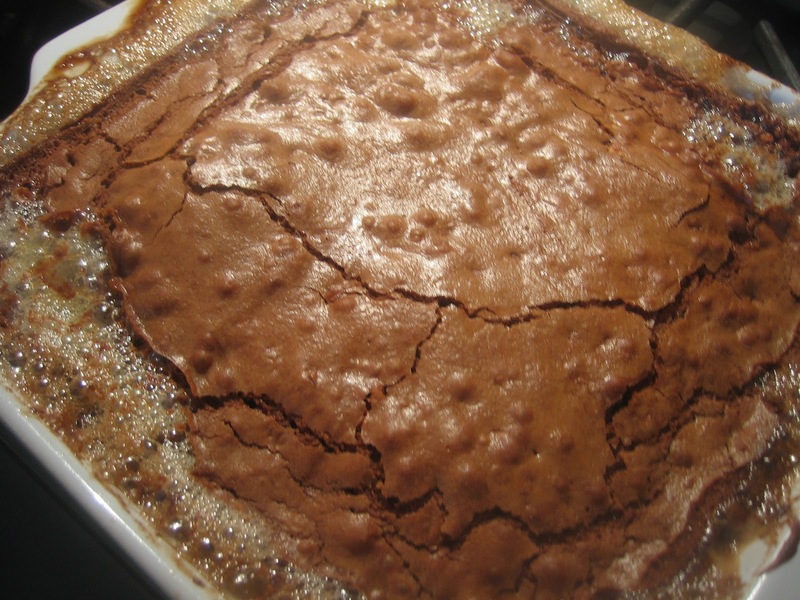 On the first day, the brownies have a slightly flaky crust and a cakelike texture. On the second day, the crust disappears and the brownies become denser and fudgier. I made them late Friday night and by Saturday evening they were at their best. I used hazelnuts in this recipe, but walnuts, chocolate chips or toffee bits would also be great mix-ins. Darryl would have scarfed about three of these. Darryl, this one's for you. Brownies, day 2--look how fudgy they are! ﻿ Preheat the oven to 350 degrees. Spray a 9 x 9 square baking pan with baking spray with flour, or butter and flour it. Using a double boiler, melt the butter and chocolate over low heat until melted, then allow to cool. Using a hand mixer, beat together the sugar, eggs and vanilla until just combined, then beat in the cooled chocolate. Sift the flour and salt together in a small bowl, then add to the chocolate mixture. Beat the mixture until well-combined, then stir in the hazelnuts. Spread the batter in the pan and bake for 30 to 33 minutes, or until a toothpick comes out clean. Allow them to cool for an hour, if you can--David was into them at the half-hour mark and they were still great. I am sorry for the loss of your friend but glad you had a good weekend to help you through it. PS Brownies always help. I always cook when I'm stressed/sad/happy/whatever. Your brownies look divine! Love the fudgy picture! I am sorry about your friends passing, but it is quite nice to have such fond memories of him. As for the brownies day 2 has me completely smitten. I know, right? Who wants to put the (minimal, in this case) effort into making baked goods and having them be awful the next day? I'm sorry for your loss. I'm glad to hear you at least had a good weekend. These brownies are just gorgeous. I LOVE a good brownie that's fudgy with the flaky top! The brownies look like a great tribute to your friend. I've really yet to meet the perfect brownie. There are so many in the running, though. I'll be more than happy to add this one. I love fudgy! I'm so sorry about your friend, I just lost a friend in her mid-30s of not-so-natural causes (aka cancer). :( It is very sad. I'm glad you had good memories though, I am trying to focus on that with my friends as well! I will try those brownies, definitely comfort food!! Jane, I'm so sorry about your friend. That's an awful, long death. You're right, these are so comfort food. Cheers to Darryl! I am sorry about the loss of a friend who obviously made you smile and laugh. I don't doubt that these may be the best brownies...The hazelnuts got my attention. Cheers to Darryl indeed--he was someone who would want to be remembered with good food and drink, not moping. 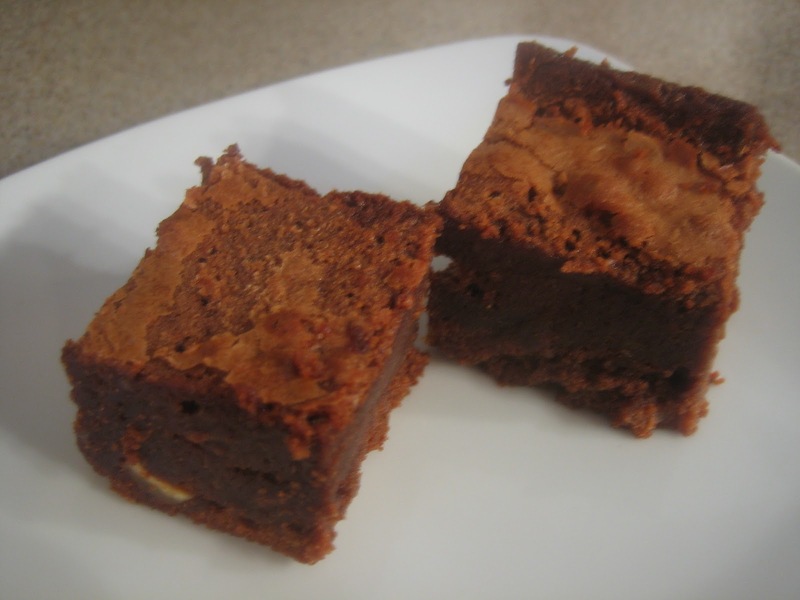 Love hazelnuts and love brownies ~ perfect combination! Sorry for you loss. I'm so sorry to hear about the death of your friend. He was so young, and it sounds like he was a wonderful person. How kind of you to dedicate these brownies to him! Sorry to hear about your friend's death at such young age. I like the denser, fudgier brownies that you took for the potluck. I am very sorry for the loss of a friend. 40 something is still so young... :-( I'm sure he's happy seeing this post with delicious brownies. I never knew about 2nd day brownies being better. I'm not a baker and I still don't know many of common sense! Looks extremely delicious! I'm not sure all brownies are better the second day--if they are really chewy to begin with, they might be stale. I think because these have so much butter, they might keep longer. I am sorry to hear about you friend. (40 is sooo young)! Nothing like Chocolate to spread some cheer, though. Even for someone like me we don't fancy desserts, I would love to have a small piece of these brownies. I also like that its simple to be made. Sad to hear about your friend and hope you are all feeling better. These are rich and a small piece definitely does the trick. They take less than 10 minutes to put together. I'm so sorry to hear about the loss of your friend!! It makes everyone realize how precious life truly is... Glad you saw your first boyfriend....and these gorgeous brownies. Take care. Few desserts can stand up to the classic brownie. So versatile, always delicious, and never refused! I hope you recover swiftly from your loss. I am so sorry to hear about your friend...hard to make sense when we lose someone at such a young age. I am glad you celebrated in a style he would approve of. The brownies look divine and since I am always hunting for the "worlds best" brownie recipe I'll give this one a try. Hope your week is off to a good start! My "World's Best" is probably an exaggeration, but these are so easy and tasty. David ate the last one last night--it was three days old, and still moist and fudgy! i love the hazlenuts in this! these look so fudgy and delicious! Thanks to everyone for their good wishes--Darryl had a lot of friends and a very loving family. Even though he died at 46, he lived a full life in a lot of ways. My condolences about your friend but am glad you still managed to keep a good mood through this weekend and spread chocolate loving! I'm so sorry to hear about your friend RIP for him !! Im sorry for your loss.... the best memories and times I have had with loved ones I've lost have always been centered around meals and sharing stories. The brownies seem like the perfect thing to make and share and remember. I'm sorry to hear of the death of your friend...I think he would have loved these brownies, too. I've made Fat Witch brownies before...so darn good! I'm sorry to hear about your friend! These brownies look really wonderful! Love the hazelnuts! Metamorphosizing brownies? These found fab! I am so sorry to hear about your friend. These brownies seem like a great way to celebrate his life and spirit! I'm sorry about Darryl. What a nice thing to do, it sounds like you know he would have loved them. They sound great. It looks as if it is showering chocolates on your blog! This looks fabulous and my kids are going to love it! Will try this recipe soon and at double portion! So sorry to hear of your loss. Love your recipe, though. So sorry to hear about your loss. Great recipe! Awww .... what a lovely, "sweet" dedication. I'm so sorry to hear of the loss of a good friend. I'm sure he must be smiling widely at this .... I know I am. Brownies are always a winner! Sorry to hear about your friend! Its incredibly sweet for you to dedicate this post and those decadent brownies. http://creativecommons.org/licenses/by-nc-nd/2.5/. Watermark theme. Powered by Blogger.